DCU won the O'Connor Cup last year. An unstoppable fifteen minute scoring spree and successful second half blanket defending delivered UCC a win at the home of defending champions DCU in Wednesday night’s clash. 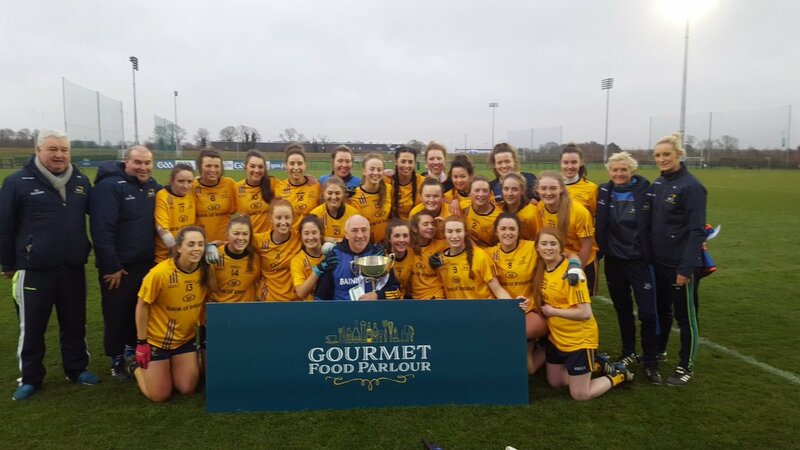 The visitors put 2-5 past DCU unanswered in the second quarter of the game and held out against increasing pressure from the hosts in the second half, spurred by super sub and star of last year’s final Aishling Moloney. It was a promising start for DCU when half-forward Victoria Hall hit the post with a goalbound shot after just one minute of play. The hosts’ ability for good counter attacking play was showcased by Hall and by midfielders Jennifer Dunne and Muireann Atkinson, as Hall created another opportunity for a goal early in the game with a solo run. DCU scored 0-4 in the first quarter, 0-3 from corner forward Ciara Flanagan, but conceded 0-4 in frees from UCC’s full forward Ciara McCarthy. Another goal was denied for DCU by the goal line heroics of Mairead Corkery, the third chance denied for the hosts. Very little of the game was played in the middle third of the pitch, with chances being made or broken by battling for space and possession at either end of the pitch. Throughout the game UCC’s backs showed strength in stopping attacks and playing the ball into space in the midfield. UCC’s scoring spree was kick started by a goal in the 20th minute, as Libby Coppinger converted a rebound off Hannah Looney’s shot that hit off the post five metres above the pitch. This was followed closely by a counter attacking goal finished by Hayley Ryan who scored a rebound off a saved shot from Ciara McCarthy. The second half started with the hosts trailing UCC 2-8 to 0-4, but the reaction was immediate with a quick-fire point from Victoria Hall. DCU then found the back of the net courtesy of Aisling Murphy’s shot from inside the parallelogram. The momentum briefly switched back to UCC, who netted a goal from a shot from Mairead Corkery aimed for a point that flew over the head of keeper Emer Ní Eafa’s head and dipped into the top left corner. After this UCC picked up just one more point in the half. The back line of Mullaney, Casey and Dillon made many strong plays for UCC in a defensive effort that for a long period of time required 14 players to be positioned in their defensive half. However, DCU’s achilles heel was how inaccurate some of their shots were, posting seven wides in the match, some from frees, and counterbalancing the scoring work done by substitute Aishling Moloney who scored 0-5 in the half. The tempo was high in the last ten minutes of the game, with sides playing end to end and UCC’s players moving more freely up and down the pitch. Aisling Murphy forced a crucial save from UCC’s Meabh O’Sullivan late on. The visitors killed any momentum from DCU well with defensive doggedness and smart possession play in the attacking third as they drew the game to a close, clinching a 5- point victory in Glasnevin. UCC manager Shane Ronayne said he was delighted with the win in Dublin saying that “we’ve a very poor record when we come away to play UCD or DCU”, adding that “this was (UCC’s) first game since November and that (UCC) were a bit ropey in the first 15, 20 minutes and DCU in fairness to them they missed three goal chances … but in fairness to our girls they followed in and were there to finish those two scrappy goals”. He also described UL as this year’s team to beat in the O’Connor Cup. DCU: E Ni Eafa, H Hegarty, L McGinley, S McLoughlin, A Cleary, S Finnegan, R Daly, J Dunne, M Atkinson, L Curran, V Hall, A Gavan Morgan, R Friel, A Murphy, C Finnegan. UCC: M O’Sullivan, A Mullaney, R Casey, L Dillon, B Condon, M Dunford, M Corkery, N Cotter, S Cronin, L Coppinger, H Looney, C Condon, S O’Leary, C McCarthy, H Ryan. Subs: A Greaney, O Lynch. Image Credit: DCUGAAAcademy / Twitter.